Dr. Husta accepts the following list of insurance providers. Select your insurance provider to see more details. I am an interventional pulmonologist with a special interest in diagnosing and treating cancer. I have a specific concentration in developing new technologies and procedures to offer my patients the least invasive way to manage their respiratory conditions. Having had the opportunity to train under leaders in the field of interventional pulmonology, I have brought their expertise and passion to my own patients. I treat major respiratory conditions, such as complex airways. These include stenosis arising from endobronchial tumors and tracheoesophageal fistulas. I often use airway stents, including 3D-modeled custom airway stents, to treat these conditions. I have an interest in robotic bronchoscopy with advanced image guidance to diagnose and locally treat cancers in the lung. I work together with thoracic oncologists, thoracic surgeons, otolaryngologists, head and neck surgeons, radiation oncologists, and interventional radiologists to provide patients with multiple treatment options. My goal is to reduce the need for multiple invasive procedures. 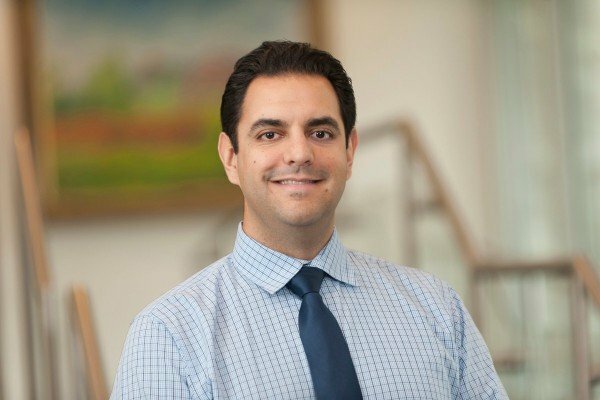 In my role as Outpatient Director of Interventional Pulmonology, I work with a team to coordinate care with other providers, both within and outside of MSK. Another specific interest of mine is to optimize the delivery of care in the outpatient setting in order to avoid hospitalization whenever possible. Recognizing that patients require flexible scheduling of outpatient care at local facilities, I am working to provide Interventional Pulmonary telemedicine visits at our satellite facilities to reach people outside the Manhattan area. My research interests involve developing new technologies for imaging airway obstructions and for the guidance of peripheral lung procedures. With the application of these novel techniques, we can offer patients with advanced diseases the ability to biopsy and provide emerging therapies to treat their condition using the least invasive means possible. Gafoor, K., Belete, H. Walczyszyn, M., Zapata, D., Husta, B.. (2018). “Utility of a 25- Versus 22-G EBUS Needle in Difficult-to-Access 2R Lymph Nodes.” J Bronchology Interv Pulmonol 25(2): e17-e19. Gafoor, K., Patel, S., Girvin, F., Gupta, N., Naidich, D., Machnicki, S., Brown, K. K., Mehta, A., Husta, B., Ryu, J. H., Sarosi, G. A., Franquet, T., Verschakelen, J., Johkoh, T., Travis, W., Raoof, S.. (2018). “Cavitary Lung Diseases: A Clinical-Radiologic Algorithmic Approach.” Chest 153(6): 1443-1465. Husta, B. C., Raoof, S., Erzurum, S., Mehta, A. C.. (2017). “Tracheobronchopathy From Inhaled Corticosteroids.” Chest 152(6): 1296-1305. Majid, A., Kheir, F., Chung, J., Alape, D., Husta, B., Oh, S., Folch, E.. (2017). “Covered Balloon-Expanding Stents in Airway Stenosis.” J Bronchology Interv Pulmonol 24(2): 174-177. Cheng, G. Z., Folch, E., Brik, R., Gangadharan, S., Mallur, P., Wilson, J. H., Husta, B., Majid, A.. (2015). “Three-dimensional modeled T-tube design and insertion in a patient with tracheal dehiscence.” Chest 148(4): e106-e108. Husta, B., Devarajan, S. Reichner, C. A.. (2014). “Complication of antiquated tuberculosis treatment.” Respir Med Case Rep 13: 12. Visit PubMed for a full listing of Dr. Husta’s journal articles. Pubmed is an online index of research papers and other articles from the US National Library of Medicine and the National Institutes of Health.